"I’m so thankful for CARRA. They saved my son from a lifetime of pain and disability by working together to learn better ways to treat his condition." CARRA formed in 2002 to find answers to the many questions doctors and patient caregivers have about managing pediatric rheumatic diseases. Creating CARRA enabled more children to participate in studies leading to faster, more reliable results. 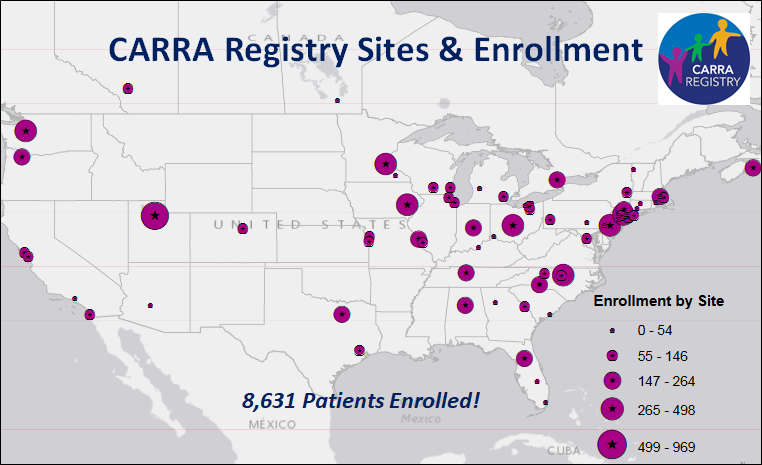 CARRA’s research network includes almost every pediatric rheumatologist in the U.S. and Canada. Members include clinicians, researchers and research coordinators. The Arthritis Foundation is America’s most trusted source of information and support for caregivers living with pediatric rheumatic diseases. The Arthritis Foundation has funded CARRA’s infrastructure and operations since the beginning and the organizations have been collaborative partners for more than a decade. In 2015, the partnership evolved, creating a space which marries CARRA’s expertise in research with the Arthritis Foundation’s expertise in support. Expand research about the impact, unmet needs, and treatment of pediatric rheumatic diseases. Prioritize patients’ and caregivers’ participation in meaningful and high-quality clinical and translational research.